Product information "Typhoon H (UK Version)"
Typhoon H is an advanced aerial photography and videography platform available in such a compact size. Driven by customer demand for a design that goes beyond the limitations of a traditional quadcopter, Typhoon H delivers capabilities previously only found in high-end professional offerings, but at a consumer price. Typhoon H offers flight durations of up to 25 minutes while filming with the CGO3+ 4K UHD camera. The Android powered ST16 Ground Station features a 7-inch touchscreen that displays live footage of your flight in HD 720p resolution and enables a wide variety of autonomous flight modes. The 3-axis anti-vibration CGO3+ gimbal camera captures ultra-stable 4K ultra high definition video, vivid 12-megapixel still images and can be rotated through an unlimited 360° range of motion. The CGO3+ gimbal camera features a high-quality glass wide-angle lens with a 94° field of view, and offers manual camera settings while in flight. The ST16 Ground Station is an integrated transmitter, receiver and Android platform that gives you full control over Typhoon H, allowing you to easily program autonomous flight and capture stunning photos and videos. The large 7-inch integrated screen displays real-time footage of your flight, eliminating the need for an external device. Point of Interest (POI): Select a subject and Typhoon H will orbit that subject autonomously. Journey Mode: Typhoon H will automatically go up and out, as far as 90 m, and capture the perfect aerial selfie. Return Home: Simply switch to Home Mode and Typhoon H will return and land within 8 m of you. Quick release buttons make installing and removing each propeller simple and fast. In spite of its simple action, high-performance propellers make Typhoon H agile, fast and instantly responsive to commands. Typhoon H’s landing gear retracts out of the way to give you a full, 360° view of the world without anything obstructing your view. Each one of the six arms folds down for convenience and compactness. 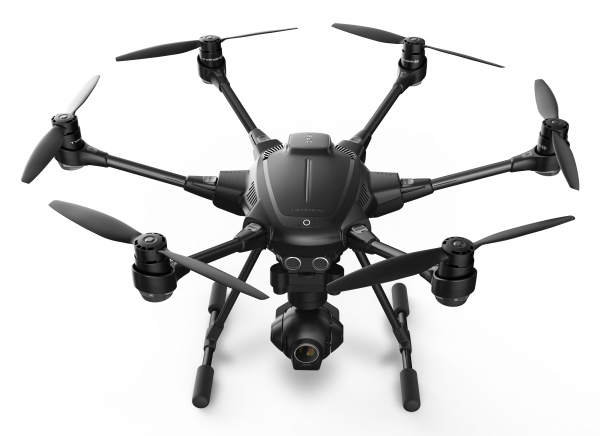 The Typhoon H includes: Typhoon H hexacopter, CGO3+ 4K gimbal camera, ST16 remote control, 1 battery, user manual and accessories. Related Links "Typhoon H (UK Version)"